Light Emitting Diode (LED) technology is nothing short of a revolution in lighting. Just as Edison and Swan's incandescent bulb began to flourish at the start of the 20th Century and grew to replace nearly all previous forms of controlled illumination, LEDs are quickly becoming the light source of the 21st Century. Rivaling incandescent and fluorescent bulbs for use in general lighting, LEDs also have more advanced applications, opening the door to many technologies previously out of reach. 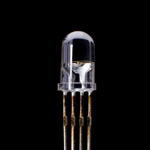 Tekcore is proud to be a leader in the LED technology industry. Through our commitment to quality and our serious focus on continual research and development, we strive to help the world further realize all that LEDs have to offer, lighting the way for future generations.